Robert Boyle was a 17th century natural philosopher, chemist, physicist, and inventor, also noted for his writings in theology. He is best known for Boyle's law. 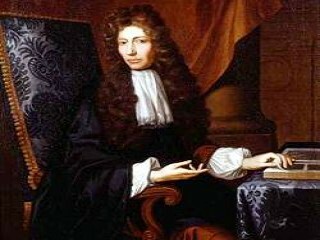 Robert Boyle was a 17th century intellectual whose emphasis on experimentation and quantification helped lay the foundation for modern chemistry. Born in Ireland to an aristocratic family, he entered Eton College at the age of 8. He then toured Europe and studied abroad as a young teenager, at one point having a religious experience that turned him into a devoted Christian. A student of natural philosophy, he proposed an early atomic theory of matter, formulated the first definition of an element and conducted rigorous experiments with detailed documentation. With his Oxford assistant Robert Hooke, Boyle devised an air pump that allowed him to experiment with vacuums and the properties of gases, metals, combustion and sound. He is known for Boyle's law, which states that the pressure and volume of gas at a constant temperature have an inversely proportional relationship (in France it is known as Mariotte's law, for Edme Mariotte). A prolific writer throughout his career, he wrote on matters of science and religion and posthumously financed a lecture series designed to use science to defend Christianity.